We are in the process of collecting oral histories, photos and other artefacts about the lighthouse. If you have anything to contribute please contact us by e-mail stpetersharbourlighthouse@gmail.com, or our volunteer Syd Freiman 902-961-8920. Thank you to Dennis Taylor for sending us these bits of incite and oral history about his grandfather, William Geldert (keeper of the lighthouse 1931-55). "William was born in Lunenburg in 1892. 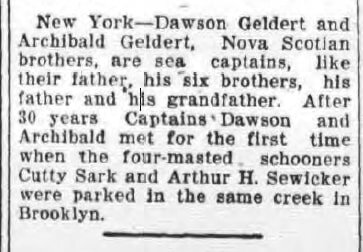 His father moved the family from Lunenburg to the St Peters Harbour area in 1906." "While my grandfather (William Geldert) had the contract to operate the lighthouse, it was his children who were given the task of lighting it. My mother Marion Geldert was the oldest of William and Amy (their picture is on your website, courtesy of my cousin) Geldert's children, and the first tasked with walking to the lighthouse to light it. Her older siblings also had to make the trek from their house in Morell (on the Red Head Harbour road not far from the rail crossing - it is still there). What a hike when you look at the aerial photos. The children had to walk to and from the lighthouse. No four-wheeler or bike to ride on!" "William served as the first president of the Morell Legion, being one of its charter (received Dec 13, 1946) members. When the Morell Branch opened its new branch in 1964, it awarded a badge for his service posthumously to his widow, my grandmother Amy."